Protected bikeway on J Street at 21st Street. The dense, urban downtown Sacramento Grid is an ideal place for making trips by bike. In fact, the Midtown neighborhood has rates of bicycling equal to parts of Davis. We strongly support the City of Sacramento’s ongoing efforts to install bike infrastructure that makes biking a convenient, comfortable, safe alternative to driving. – Along the south and east edges, at the ramps leading to and from the Capitol City Freeway. – North of P Street and west of 16th Street, the area comprising the State Capitol, City Hall, County Administration Building, Golden 1 Center, Central Library, Sacramento Valley Station and the Kaiser Medical Center. This part of the Grid has the highest concentration of public destinations, employment centers and transit hubs, but the fewest streets with bike lanes and other bike-friendly infrastructure. The Golden 1 Center was constructed without any improvements to accommodate bikes on adjacent streets. – North from downtown into the River District, which is served by just three streets, two of them unusable by bikes. Improving access to the Sacramento Northern Bikeway remains a critical need. We recently helped gather substantial community input to demonstrate the demand for much better access for people on bikes on N. 16th Street. Read more here. N. 16th Street at the Union Pacific RR undercrossing is too narrow for bike lanes. 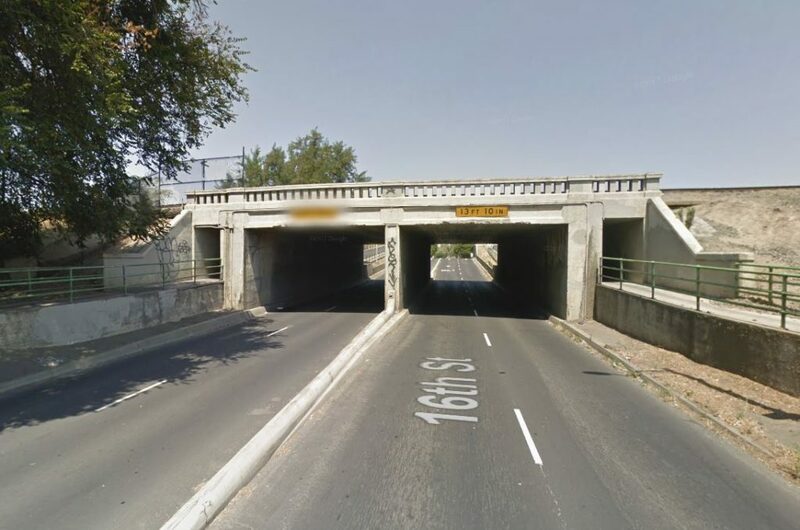 The City of Sacramento designated the 4-foot-wide pedestrian tunnel on the right as a bike route. The City of Sacramento’s Vision Zero program aspires to eliminate severe injury and fatal traffic collisions of all types by 2027. 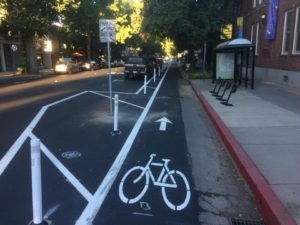 In setting this goal, the City of Sacramento has committed to making safety its highest priority in deciding where to implement roadway improvements and other interventions. As a member of the City’s Vision Zero Action Team, we strongly believe that mobility must be an equal priority for the Vision Zero program. We work with neighborhood groups and others to ensure that the City’s actions to implement Vision Zero are thoughtful, balanced and equitable. Read more here. Stockton Blvd. at Fruitridge Road in South Sacramento. Due to its high rate of traffic deaths and injuries, Stockton Blvd. is being prioritized for Vision Zero improvements. One of our region’s most valuable recreational assets is a network of off-street, paved trails for biking and walking, including the Jedediah Smith Memorial Trail along the American River. Multi-use trails enable people to enjoy healthy activity without driving and introduce children to the joys of riding a bike. They also serve as comfortable, convenient routes for everyday travel by bike. We’re currently actively advocating for seven trails and trail projects in our region: Two Rivers Trail, Sacramento Northern Bikeway, Sacramento River Parkway and Del Rio Trail in Sacramento, Sycamore Trail in West Sacramento, Cordova Creek Trail in Rancho Cordova and Dry Creek Greenway in Roseville. Prop. 6 on the Nov. 2018 general election ballot would repeal a statewide funding source enacted last year that funds crucial safety improvements to roads and bridges. For the City of Sacramento, passage of Prop. 6 would eliminate $8-9 million per year (one-third of this year’s entire transportation budget) used for local preventive maintenance and safety improvements, and endanger existing grants and contracts for making improvements to accommodate people on bikes. We’re part of the 300+ member statewide No on Prop. 6 coalition of labor, business, public health and transportation groups and public agencies united to protect this critical funding source. Sacramento County and the cities of Sacramento, Citrus Heights, Elk Grove, Folsom, Galt, Isleton and Rancho Cordova mainly rely on revenues from the countywide half-cent sales tax enacted through Measure A in 1989 to support transportation improvements. In 2016 voters narrowly failed to pass a second half-cent transportation sales tax measure developed by Sacramento County without any input from active transportation and community advocates. We’re leading a coalition of environmental, active transportation, affordable housing and community groups to help Sacramento County develop and pass another transportation sales tax measure. The Sacramento region has enormous potential as a place where bicycling is a convenient, comfortable, clean form of everyday travel. To help realize that potential, we advocate for best practices in planning, engineering, funding, programs and laws that prioritize active transportation. Through Sacramento’s Bicycle Advisory Committee, we got the City of Sacramento to add explicit goals for connectivity, equity, safety and ridership when it updated its Bicycle Master Plan in 2016. As other jurisdictions update their bicycle master plans, we’ll work to ensure that they reflect modern best practices for meeting these goals. The City of Roseville plans to begin updating its bicycle master plan. Sacramento County’s Bikeway Master Plan was last updated in 2011, well before the adoption of federal and state standards for protected bikeways and other modern bicycle infrastructure. We led a coalition campaign for crucial safety improvements on Carlson Drive near the Sac State University campus in East Sacramento. We also worked closely with groups supporting the Freeport Blvd. bike improvements in Sacramento’s Land Park neighborhood. We’re routinely invited to participate as a stakeholder in the early stages of major proposed projects. We represent people on bikes in forums organized by public agencies to help shape such major long-term projects as the Green Line to the Airport and Plan Folsom Blvd., and have an ongoing role in the implementation of bike share in our region. And we represent people on bikes on advisory committees and working groups such as the SACOG Bicycle-Pedestrian Advisory Committee and Sacramento State University Bicycle Task Force.